In this blog post we explain what is Referrer spam, this new kind of spam that has recently appeared on the Internet. We also provide solutions to stop it and preserve the quality of your analytics data. Referrer spam (also known as log spam or referrer bombing) is a kind of spamming aimed at web analytics tools. A spammer bot makes repeated web site requests using a fake referrer URL to the site the spammer wishes to advertise. How to deal with Referrer Spam? Referrer spam is still new and analytics tools are all handling it differently. At Matomo (Piwik) we started working on mitigating Referrer spam more than a year ago. If you use Matomo and keep it up to date, you do not need to do anything. Referrer spammers are automatically excluded from your reports to keep your data clean and useful. New spammers are continuously detected and added to Matomo’s blacklist on each update. If you find a new spammer in your analytics data, you can even report it so that it is added to the Piwik’s open referrer blacklist and blocked for everyone. 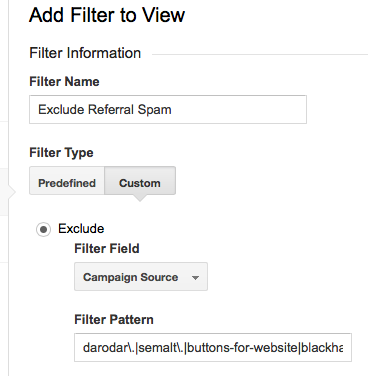 Google Analytics doesn’t offer any spam protection by default. It can however be configured manually using a custom Filter. If new spammers arise you will need to update this list. You can also use Piwik’s referrer blacklist to exclude all the spammers currently detected. Many web analytics tools do not yet handle Referrer spam and when using these tools, you will often find a lot of spam data in your Referrer Websites analytics reports. If you use an analytics tool that does not exclude Referrer spam, we recommend to contact the vendor and ask them to implement a mechanism to remove these referrer spammers. As of today many analytics vendors still have not mitigated this issue. At Matomo (Piwik) with the help of our large community we have decided to tackle this growing spam issue. We have created a list of up to date referrer spammers that anyone can edit. The list is available in a simple text file on Github: github.com/piwik/referrer-spam-blacklist. The list is released under the Public Domain and anyone can use it within their applications to exclude referrer spammers. Many people have already contributed new spammers to the list. We invite you to use the list in your apps and websites and help us keep the list up to date! Let’s unite and fight the spammers together.